Burnt Banksia Cone. Fire has played an important role in shaping the evolution of Australian vegetation, and many plants are well-adapted to surviving fierce bush fires. 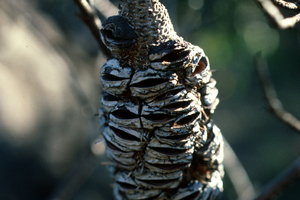 Some plants, such as this banksia, have woody fruits which open as a result of fire, dispersing the seeds into the nutrient rich environment which results from the fire's passage.